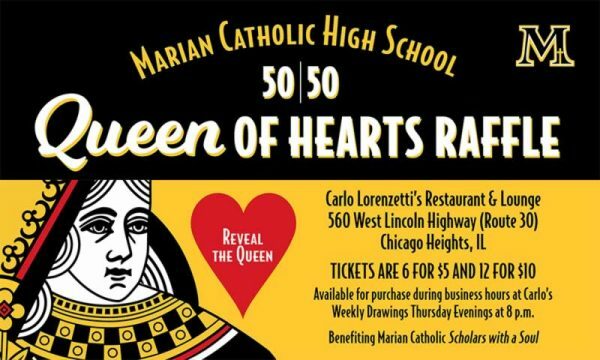 Chicago Heights, IL-(ENEWSPF)- Marian Catholic High School is hosting a Queen of Hearts raffle at Carlo Lorenzetti’s Restaurant & Lounge in Chicago Heights, Illinois. The 50/50 progressive raffle, which has gained popularity over the last few years, consists of a deck of 54 playing cards, including two jokers, which are placed face down and sealed on a mounting board on display at Carlo Lorenzetti’s. The back of each card is numbered one (1) through fifty-four (54). 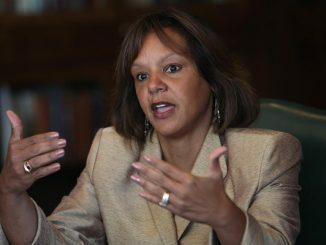 Marian Catholic High School purchased the sealed board from a third party gaming company and does not know the location of the Queen of Hearts. Once a ticket is drawn, the selected playing card will be revealed. If the Queen of Hearts is not selected, the game and the jackpot will rollover to the next week. After the drawing, all tickets will be destroyed and may not be used again. Raffle tickets are six for $5. Participants can purchase as many tickets as they wish. Ticket purchases must be paid in cash and can be purchased immediately after the prior drawing up to fifteen (15) minutes prior to the next drawing. There can only be one individual’s name per ticket. All proceeds from the raffle benefit Marian Catholic High School. Tickets can be purchased at Carlo Lorenzetti’s Restaurant & Lounge located at 560 West Lincoln Highway (Route 30), Chicago Heights, Ill. 60411. Must be 18 years or older to purchase a ticket and/or claim a jackpot. The first drawing for the raffle will take place on Thursday, January 31 at 8:00 p.m. at Carlo Lorenzetti’s. Only 1 ticket will be drawn each week. Winner need not be present. Thereafter, the drawing will be each Thursday at 8:00 p.m. at the restaurant. Minimum guaranteed payout on the first drawing is $5,000.